New answers may have just emerged in a long-standing debate in the field of oncology and molecular evolution. The neutral theory of molecular evolution states that changes occurring at the molecular level are not caused by natural selection, but rather by the random genetic drift of mutant alleles. In contrast, Darwinian selection adheres to the idea that a molecular mutation holds some selective advantage over the wild-type, allowing it to thrive. When viewing these two theories through the lens of carcinogenesis, it is not difficult to envision the applicability of either theory. However now, new evidence from scientists at the University of Chicago and the Beijing Institute of Genomics may tip the scales in favor of neutral theory. This collaborative scientific effort assembled data from one of the most rigorous genetic sequencing ever carried out on a single tumor—revealing a much greater level of genetic diversity than expected. The investigators excised a tumor roughly 3.5 centimeters in diameter (slightly smaller than a ping-pong ball), from a hepatocellular carcinoma tumor of the liver. 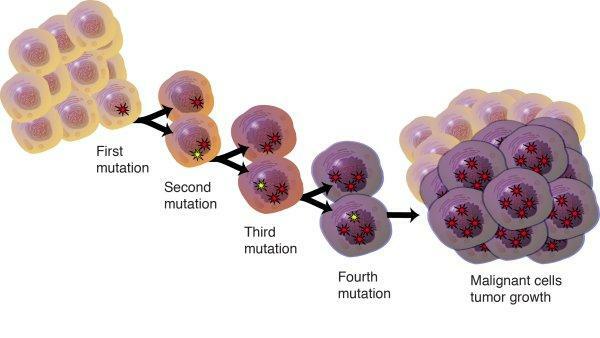 The research team estimated that the tumor contained more than 100 million distinct mutations within genetic coding regions, which is thousands of times more than they anticipated. The impact of this finding is that even microscopic tumors are likely to contain extremely high genetic diversity and with so much variation there are likely many cells contained within able to resist standard post-surgical cancer treatment such as chemotherapy and radiation. Scientists at the Beijing Institute of Genomics sampled nearly 300 regions from one slice of the hepatocellular tumor and sequenced or genotyped each one searching for genetic changes. Once they analyzed their data and applied a modern population genetic theory, their results lead them to the 100 million coding-region mutation estimate for the whole tumor. This extensive level of heterogeneity within a single tumor, which is way beyond what a Darwinian process would permit, makes the selectionism vs. neutralism debate of the 1980s “suddenly medically relevant,” Dr. Wu remarked. Since previous to the current study, no one had ever genetically dissected a tumor as thoroughly, the commonly held theory was that tumors had from a few hundred up to 20,000 genetic alterations that were not present in the patient's healthy cells. “This could potentially change how we think about tumor growth and spread, but the direct clinical implications of this study may not be obvious on the surface,” added co-author Daniel Catenacci, M.D., assistant professor and medical oncologist at the University of Chicago. While the bulk of the mutations were at very low frequencies, drug intervention could provide some of the genetic mutations with a progression path forward. Since the current study only focused on a single tumor type, it remains to be seen how comparable this data will be for other types of cancerous tumors. However, regardless of narrow focus, the results from this analysis raises important question about tumor evolution and heterogeneity.